A Complete Year of Daily Word Work for 195 Words! This product combines several research-proven word work strategies into one daily practice page. 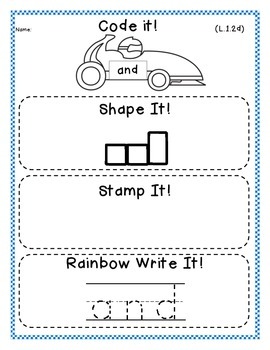 The strategies are described in the preview and include: Code It, Shape It, Stamp It, and Rainbow Write It. These strategies can be used as homework, morning work, or at a literacy station. It can also be used to document strategies for RTI. 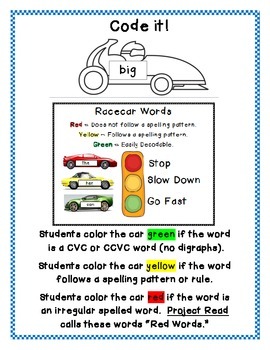 The words chosen for each week are based on my "Racing to Read" word study on TPT. They cover many of the Dolch and Fry words and also the "Red Words" in Project Read. There is an alphabetical list of all words included. Having only one word per page allows you the flexibility to print and use the words in the order that works best for your class. * 39 Unit Word Work Packet Cover Sheets. I staple the five words for the week to this cover sheet. I have also included a blank cover sheet. * Table of all word wall words in alphabetical order with unit number when taught. 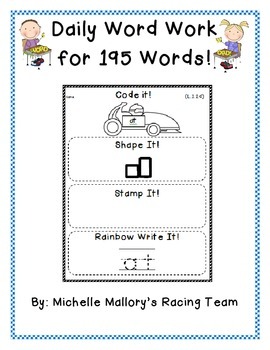 * 195 word work strategy pages (one word per page) Most schools have only 180 days, so this is enough for an entire year! 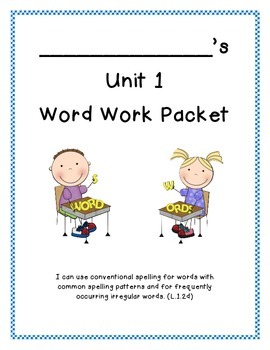 There is also a blank word work strategy page to create pages for words not included in this purchase.